Dare to question the way you dress! Your personal fashion stylist that will help you create a unique, versatile wardrobe, so you never have to think about what to wear again. Donec sed odio dui. Aenean eu leo quam. Pellentesque ornare sem laca quam venenatis vestibulum. Use the “Spider" to select your daily lifestyle so you can be better prepared to dress for any occasion. Dress smart and invest wisely in your looks. Embrace simplicity, get help matching clothes, and know what to wear with just the click of a button. It’s time to shop smart! Find out what items are must-haves for your wardrobe. Discover upcoming trends, join our blog community, and share your thoughts! A smart way to declutter your closet. How many times do you open your wardrobe and think you have nothing to wear and yet have a full wardrobe? Six capsule wardrobe myths and how to bust them. Myth: You have to look minimal in your aesthetic. Press Generate button to see recommended looks for the occasion or dress-code you need: Office, Smart Casual, Going Out, City Break… Tell the app which Wearing Occasions and Styles are relevant for you and get inspirations on what to wear! Go through the list of Essential Items that will help you create minimalistic “capsule”, yet efficient wardrobe. 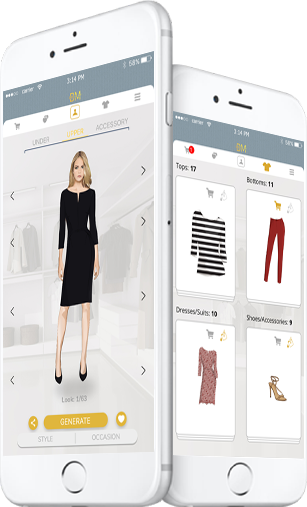 This section of the app conveniently groups all clothes into Tops, Bottoms, Suites/Dresses, and Accessories. Explore what they are, if you are missing any, and where to buy them (press the Shopping Cart icon). Mix and match the pieces on the mannequin and save your favorite looks. Swipe clothes manually left/right; control which layer of clothes you want to edit (UNDER, UPPER, ACCESSORY); when ready, press the Heart icon to save you Favorite Look. a.	Prioritize Wearing Occasions. Looking for Smart Casual outfit inspirations? Need an advice on what to wear in the Office? Do you want to have a catchy look while on a casual walk..? Fill in the relevant segments and deselect the irrelevant ones, so that the app recommends only the sets and clothes you need. b. Choose what Styles you prefer: Formal, if you want to create official, classic looks, or Relaxed, if you are more into “dress-code-free” styles. c.	Decide on the breadth of your wardrobe. Ideal for creating capsule wardrobes, the Budget slider lets you choose between Minimal or Optimal wardrobe sizes. Depending on your preferences, the app will recommend you as few as 10-15 must have items (that will create more than 20 unique looks) and as many as 50 essential pieces (allowing you to create more than 70 unique outfits)! Buy only the clothes you need – avoid purchasing unnecessary items that clutter your closet and life! With the help of Dress-MeApp’s Shopping Cart keep track of which items you need and explore where to buy them. Access your previously saved Favorite Looks and create a schedule of what to wear in the coming days and weeks. Press the Share button to send the outfits you have created to your friends on social media. © 2017 Dress-MeApp. Trademarks and brands are the property of their respective owners.